2. 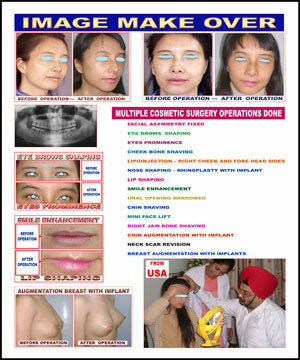 Implant Shape (round or anatomic (teardrop)) Round implants are shaped like jelly donuts. Teardrop implants are shaped more like the breast [ relatively costly] At first, you might be thinking that (of course) teardrop implants would be better. However, most plastic surgeons disagree: they think that teardrop implants tend to become round with the forces of healing and that the teardrop implants do not necessarily give a better result. Furthermore, they find that teardrop implants may rotate, giving an unnatural appearance, and they impose restrictions in that they must be textured. Saline implants can develop a leak and deflate. If this happens, your breast will shrink to its preoperative size over a matter of a day or so. You will need another breast augmentation surgery to replace the deflated implant. 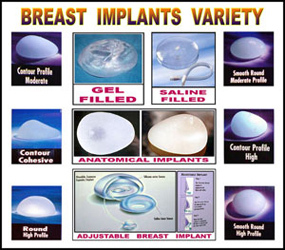 Deflation is most likely to occur in implants that have not been overfilled. Yes, you read that right. Overfilling reduces deflation. This is because deflation is a result of folding of the implant shell, which occurs repetitively in implants that are not overfilled. After the implant shell has folded hundreds or thousands of times with your natural body movement, the implant shell tears - just like a piece of paper that has been folded time after time.